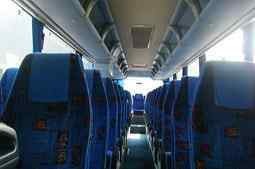 Maidstone minibus hire is an established and trusted local business, specialising in providing a reliable and affordable transport service for events and trips. We will be pleased to take orders for group trips for families, educational visits by schools and colleges, and corporate or business visits, seminars and away days; please fill in your details in our contact form to receive a quote reserve your coach and driver for your next excursion. Our fleet of vehicles is available to serve the Maidstone postcode areas ME14, ME15, ME16, ME17 and ME18. Maidstone is the county town of Kent, often referred to as the capital of the ‘Garden of England’. Running through the town is the river Medway, which has been a rough for Kent’s agriculture and trade for centuries. While no longer a commercial stream, today it is a popular tourist stop and traffic up and down the river are primarily visitors to the area. For those wanting to see the sights, Leeds Castle and Mote Park are two outdoor spaces which every visitor should take the time to see. Leeds Castle is an historic site renowned for its days out, while Mote Park is something of a hidden treasure where an inexpensive family fun day can be had by all – both are perfect for group excursions, whatever the weather. Vintners Valley Nature Reserve is ideal for ramblers and amateur walkers alike, a quiet and beautiful reserve in the heart of Kent – and don’t miss the views at Wild Horse Country Park, either. Top sites which visitors to Maidstone must see in their trip are its many theatre, principally the Hazlitt Theatre, which hosts play, musicals and comedy events throughout the year. The Maidstone Museum and Art Gallery is an unmissable cultural spot in the town, with its 600,000 exhibits ranging from Egyptian artefacts and Japanese art to local history. Maidstone regularly hosts a wide variety of events. Why not book your minibus or coach trip to Maidstone now to guarantee your place at these festivals, attractions and special events in the town? High Defintion Festival (5th and 6th September 2015): Hop Farm is the home to the weekend dance spectacular, now in its fifth year. A special set comes fom US DJ Josh Wink, with live sets from Fabio & Grooverider, Eddy TM, DJ Luck and MC Neat, Wookie, Redlight and many more. Leeds Castle Food Festival (11th-13th September 2015): The 900-year-old castle brings local and international food and drink together into one heavenly site for foodies! Handmade British and global eateries, bakers, charcuterie and artisan cheesemakers will be there – take away gifts, and wines and beers for yourself! The Social Festival (12th September 2015): Mote Park hosts the annual dance music festival, featuring as its headliners this year the techno legend Richie Hawtin, Sasha, Marc Fanciulli, Four Tet and Joy Orbison. The Maidstone Mela Film Festival (13th September 2015): The multicultural film festival returns to Mote Park, with food, drink and events for all the family. Leeds Castle Flower Festival (22nd-27th September 2015): This annual festival finds the stunning 500-acre castle site transformed by professional horticulturalists – and your attendance is included to the entrance fee to the castle itself. Apple and Cider Fayre (4th and 5th October 2015): Kent Life is proud to showcase the county’s finest fruit – the cider tent hosts local brews, while live music and haybales full of country charm await guests. Freshly-picked cooking and eating apples aplenty also await. Frightening Fort Horsted Ghost Hunt (12th December 2015): Except spooky goings on this winter in the largest of the five forts of this defensive stronghold. The Maidstone Symphony Orchestra (30th January, 19th March and 21st May 2016): The festival of virtuoso and classical music kicks off at Mote Park. Maidstone is also home to two large shopping outlets, making it one of the top five retail towns in the UK: The Mall, Maidstone and Fremlin Walk combine to almost a million square feet of boutiques, national chain and department shops and designer stores. The nearby Maidstone Museum and Art Gallery houses a fully-restored nodding gold elephant from Fremlins’ brewery, from which the gate and clock now serve as the entrance to the shopping district of the same name. Stop for a drink and fine food at the White Rabbit pub, which for over two centurie has made a home in the listed building which formerly housed the Officers’ Mess of the Army barracks. And for those who want to journey on the wild side, Maidstone is a perfect place to explore by less conventional methods. Upon arrival, transfer from coach or minibus to Segway! Tours of the town by motorised self-propulsion are available; while those with sea legs or water wings can kayak and canoe down the Medway for day trips or short paddles in organised groups. If you’re not quite feeling that adventurous, boat trips can show you all the same natural beauty, in the presence of slightly calmer waters! 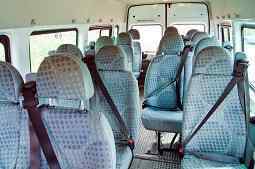 For minibus hire in Maidstone, make us your first choice. 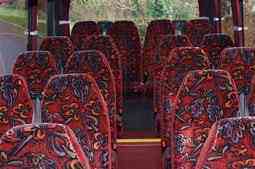 From our website as maidstoneminibushire.co.uk, we regularly offer exclusive discounts and managers’ special offers. Contact us via the the form on our webpage, or use our simple booking system directly; we guarantee attention to detail, customer care and the personal attention to make your trip straightforward and successful.